Nouns are words that refer to creatures, objects, actions or abstractions. They are defined in French by their gender (masculine or feminine), their number (singular or plural), and their determiner. ► All nouns in French have a gender, either masculine or feminine. Animates: When nouns define human beings, the gender of the noun normally corresponds to that of the person or people concerned. Thus un homme (masculine) and une femme (feminine). There are a few exceptions; the most high-profile of these is une personne (feminine), a person, whether the person is male or female. Many nouns that can either refer to males or to females have masculine and feminine forms. In some cases an identical noun can be used in either gender: example un gendarme, une gendarme (a policeman / woman). In other cases male and females are designated by a masculine and a feminine form of the same word: example un boulanger / une boulangère (A baker, a female baker). In other cases there is little consensus; there is no clear rule in modern French as to whether a female teacher should be referred to as un professeur, une professeur, une professeuse, or une professeure. All four forms are used, even in official documents. Inanimates: When nouns define objects or abstractions, they still must have a gender. The gender can sometimes be determined (or guessed) by the noun's ending. While there are a few endings which are more or less exclusive to feminine nouns, such as -ette or -euse, the gender of most nouns just has to be learned case by case, and it is not always easy. Why does one say le coton, but la chanson? The reasons are etymological (historic) – but that is of little help: genders just have to be learned. ► Nouns in French must either be in the singular or the plural. 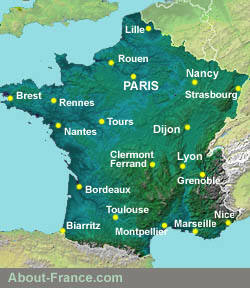 The plural of most French nouns is indicated in written French by the addition of the plural marker, normally "s". This s is not pronounced in spoken French. Examples: un homme, des hommes - un tracteur, des tracteurs. ► Most - though not all - nouns ending in -al, or -ail, form their plural in -aux. As for the French word for garlic, singular un ail, its plural form is des aulx. ► Nouns ending in -ou. Most have a normal plural in -s; but eight common nouns take their plural in -x : bijou, caillou, chou, genou, hibou, joujou, pou. Examples: un voyou, des voyous, un hibou, deux hiboux. ► Words borrowed from English which would take an -es in the plural in English just take an -s in French. The plurality of a noun is also indicated by the determiner, and by any adjectives that describe the noun. or - in the case of compound nouns - another noun. ► When the predeterminer is an article or an adjective, it agrees in number and gender with the noun. Unlike English, a noun in French cannot be preceded by another noun in the possessive form, as there is no inflected possessive form for nouns in French. The determiner comes at the start of the noun group in French. It may be followed by one or more adjectives, from among those adjectives which, in French, precede or can precede the noun. Examples: The determiners are in bold type. Le premier grand orage de l'été. The first big storm of summer / Summer's first big storm..
Cette dame et sa très vieille tante. This lady and her very old aunt. Les trois plus grands écrivains de l'histoire. The three greatest writers in history. Several good friends, / Several of my good friends. ► There is no need for anything to follow a noun; a noun group is complete as long as it has a determiner and a noun. ► Nouns can also be followed by (postmodified by) a prepositional phrase such as a possessive form with de. Example: Le livre de mon voisin. ► Nouns can also be completed by a subordinate clause, such as a relative clause. Examples: Le livre que j'ai lu. Le livre à acheter.